Gov. Chris Christie got blistered by the public Monday after he was photographed sunning himself over the Fourth of July weekend on a New Jersey beach that had closed to everyone else because of a government shutdown. Online, people mocked the governor as selfish and arrogant and cracked jokes about the sight of the heavyset Christie in a beach chair in sandals, shorts and a T-shirt. Jokesters soon inserted the photo into an Oval Office picture and scenes from "Planet of the Apes," ''From Here to Eternity" and "The Sopranos." Christie defended his visit to the shore, saying that he had previously announced his plans to vacation at the state-owned governor's beach house and that the media had simply "caught a politician keeping his word." A plane carries a message for Gov. Chris Christie after he was spotted at a closed state beach. The Republican, named the nation's most unpopular governor in a recent poll, was photographed Sunday by NJ.com at Island Beach State Park. He and his family had the sun and sand all to themselves. "I didn't get any sun today," Christie told reporters at a news conference later in the day in Trenton. Then, when told of the photos, his spokesman told NJ.com that the governor was telling the truth because he was wearing a baseball hat. Christie, who is heading into his final six months in office with his approval rating at an abysmal 15 percent, was lambasted for what many saw as a let-them-eat-cake gesture by the state's chief executive. "Taxpayers can't use the parks and other public sites they pay for, but he and his family can hang out at a beach that no one else can use?" asked Mary Jackson, a Freehold resident walking through a mostly empty downtown near the Capitol in Trenton. "Doesn't he realize how that looks, how people will see it as a slap in the face?" Not since Christie was photographed at then-candidate Donald Trump's side last year with what looked like the thousand-yard stare of a hostage has the public jumped all over Christie with the many tools of ridicule available on the internet. Online, users made fun of Christie's weight. Others likened the beach closing to the 2013 scheme by Christie allies to close lanes and cause huge traffic jams at the George Washington Bridge. Some said Christie was trying to outdo President Donald Trump in low approval ratings. 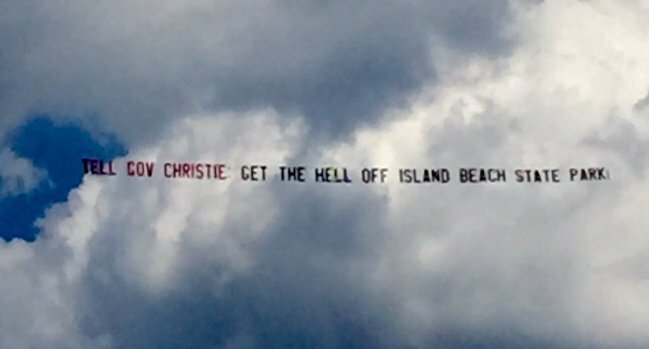 Christie's lieutenant governor, who is running in November to succeed him, said Christie's beach time was "beyond words." "If I were governor, I sure wouldn't be sitting on the beach if taxpayers didn't have access to state beaches," said Republican Lt. Gov. Kim Guadagano. But after coming to an agreement with his legislature late Monday, Christie signed the state's new $34.7 billion budget deal, allowing for the reopening of the nonessential state services in time for the July 4 holiday. The sticking point was Christie's demand that Horizon Blue Cross Blue Shield be overhauled so that the state can tap into the nonprofit insurer's surplus to finance drug treatment. Christie had blamed a top Democratic lawmaker for the shutdown, with the state plastering CLOSED signs at parks with Assembly Speaker Vincent Prieto's picture and office phone number. "That's the way it goes," Christie said Saturday about his family's use of the beach home. "Run for governor, and you can have the residence." Later, after he was photographed on the beach, he sarcastically called it a "great bit of journalism." "They actually caught a politician being where he said he was going to be with the people he said he was going to be with, his wife and children and their friends," Christie said in an interview with the New York Fox TV station. "I am sure they will get a Pulitzer for this one." Christie's ratings were thrown into a nosedive by the bridge scandal, his own run for president and his support for Trump. In the past year, he was passed over for vice president, demoted as Trump transition chairman, and denied a top-level administration post of his liking. But Christie regularly says that the only time popularity counts is when you're running for something — and he's not. "I don't care," he said recently when asked about the fall in his ratings. Christie has been mentioned as a possible late addition to the Trump administration. But that, too, may have been thrown into question. "It is hard to imagine a worse optic for public relations on a hot July day. Pollsters may find out how low approval ratings can go in New Jersey," said Fairleigh Dickinson University political science professor Peter Woolley. "Because the story and the photos have gone national, it makes it harder for Christie to rehabilitate his career outside of the state." Prisons, state police, state hospitals and New Jersey's bus and commuter railroad remain open. The vast majority of beaches are open as well, since most are controlled not by the state but by towns up and down New Jersey's 130 miles of coastline. Christie on Monday morning retweeted posts by some of those towns promoting their beaches. "Come and enjoy them," the governor tweeted, "but use sunscreen and hydrate."